Historical references describe fastening papers together as early as the 13th century, when people put ribbon through parallel incisions in the upper left-hand corner of pages. Later, people started to wax the ribbons to make them stronger and easier to undo and redo. This was the way people clipped papers together for the next six hundred years. In 1835, a New York physician named John Ireland Howe invented a machine for mass producing straight pins. Straight pins then became a popular way to fasten papers together, although they were not originally designed for that purpose. Straight pins were designed to be used in sewing and tailoring, to temporally fasten cloth together. Johan Vaaler, a Norwegian inventor with a degree in electronics, science, and mathematics, invented the paperclip in 1899. He received a patent for his design from Germany in 1899 since Norway had no patent laws at that time. Vaaler was an employee at a local invention office when he invented the paperclip. He received an American patent in 1901. The patent abstract says, "It consists of forming same of a spring material, such as a piece of wire, that is bent to a rectangular, triangular, or otherwise shaped hoop, the end parts of which wire piece form members or tongues lying side by side in contrary directions." Vaaler was the first person to patent a paperclip design, although other unpatented designs might have existed first. American inventor Cornelius J. Brosnan filed for an American patent for a paperclip in 1900. He called his invention the "Konaclip". But it was a company called the Gem Manufacturing Ltd. of England who first designed the double oval shaped standard looking paperclip. 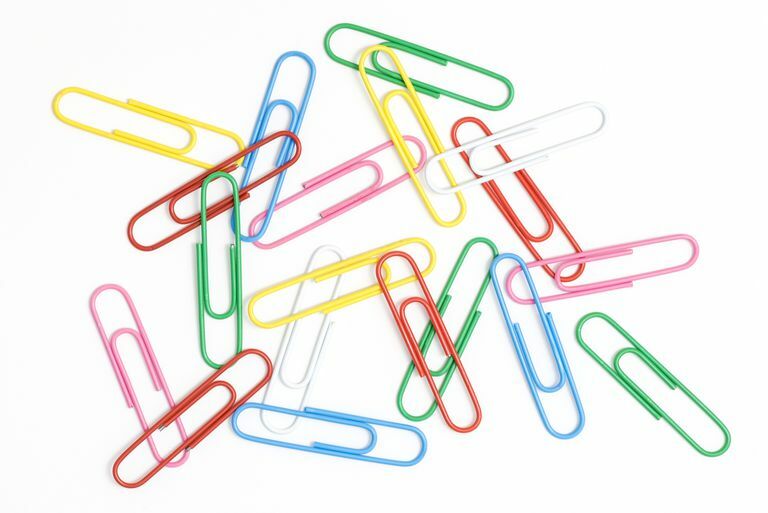 This familiar and famous paperclip was, and still is, referred to as the "Gem" clip. William Middlebrook, of Waterbury, Connecticut, patented a machine for making paper clips of the Gem design in 1899. The Gem paperclip was never patented. People have been re-inventing the paperclip over and over again. The designs that have been the most successful are the "Gem" with its double oval shape, the "Non-Skid" which held in place well, the "Ideal" used for thick wads of paper, and the "Owl" the paperclip that did not get tangled up with other paperclips. During World War II, Norwegians were prohibited from wearing any buttons with the likeness or initials of their king on them. In protest, they started wearing paperclips, because paperclips were a Norwegian invention whose original function was to bind together. This was a protest against the Nazi occupation and wearing a paperclip could have gotten you arrested. A paperclip's metal wire can be easily unfolded. Several devices call for a very thin rod to push a recessed button which the user might only rarely need. This is seen on most CD-ROM drives as an "emergency eject" should the power fail. Various smartphones require the use of a long thin object such as a paperclip to eject the SIM card. Paperclips can also be bent into a sometimes effective lock-picking device. Some types of handcuffs can be unfastened using paper clips.